Have you ever wondered how it is possible for our human body to go through growth and development? What happens when cells in our body are damaged? The answer lies in cell division. New cells replace old and damaged ones, and increase in number and size that lead to our growth. The cell division that contributes to the replacement of cells as well as tissue growth and repair is known as mitosis. Mitosis involves the division of one cell into two new cells that are genetically identical to their parent cell. How is this likeness formed? The DNA existing within the chromosomes of a cell's nucleus can make an exact copy of itself. This means that all chromosomes within the nucleus duplicate (or replicate) themselves. That is why when the cytoplasm divides later, each of the two daughter cells has exact copies of the original chromosomes and DNA! Note: During the division, the cell splits the copied chromosomes equally to make sure that each daughter cell has a full set. Refer to the following diagram, which depicts the series of stages, known as the cell cycle, undergone by a cell that is about to divide. 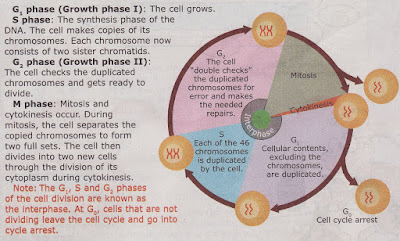 Basically, the cell grows, copies (or duplicate) its chromosomes, and then divides to form two new and identical cells.